Residency Agreements and Arbitration Clauses - Shalloway & Shalloway, P.A. Clients may consult our firm to review the terms of a residency agreement for a skilled nursing facility. In the health care context, the enforceability of pre-dispute agreements to arbitrate instead of litigate any future claims that may arise is a subject of vigorous debate itself. Critics of arbitration clauses in the skilled nursing context argue that the stressful series of events constituting the typical skilled nursing admission experience likely places the elderly resident at a bargaining disadvantage. As a counterpoint, skilled nursing facilities are regulated on a more comprehensive level by the Nursing Home Reform Act and meet federal certification requirements. Thus, the skilled nursing setting continues to be a battleground for refining the standards of whether an arbitration clause is enforceable. Some of the arguments, such as the failure of one side to verbally explain the agreement to the other party who does not read the document, does risk watering down how two parties make an enforceable agreement. 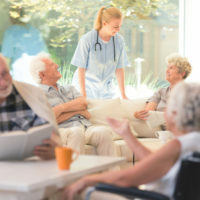 In Florida, the Second and Fifth District Courts of Appeal simultaneously issued two opinions regarding arbitration enforcement in the skilled nursing context and, in one case, the Fifth DCA certified an issue to the Florida Supreme Court as one of “great public importance.” The Florida Supreme Court then decided that skilled nursing residents cannot be bound by arbitration agreements in contracts signed with the home by family members, settling one dispute at least. Mendez v. Hampton Court Nursing Center, LLC, 203 So.2d 146 (2016). But at the root of the controversy over using compulsory arbitration, a tension exists between two approaches to improve long-term care. One approach suggests reducing the costs of dispute resolution by circumventing traditional litigation and freeing funds to improve services. The other approach advocates a focus on achieving high-quality care by ensuring that the rights of skilled nursing residents are prosecuted to the fullest extent possible under the law. Because there does not appear to be a decline or stabilization in the number of incidents leading to litigation, it seems likely that the regulation of arbitration will take on even greater importance in the future.